For patients who want to enjoy the many benefits of straighter teeth without having to wear uncomfortable metal brackets and wires, Invisalign is an ideal alternative to traditional braces. The process involves the use of a series of clear trays that are worn for a few weeks at a time. Over time, these trays gently and effectively move the teeth until they are perfectly aligned. Choosing between Invisalign treatment and braces can be a difficult and complex decision. Each treatment type has specific pro and cons. Traditional braces are most effective at treating very crooked teeth and tend to be less expensive. 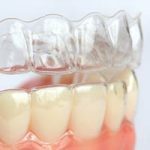 On the other hand, Invisalign can help to straighten teeth quickly while helping patients avoid feeling self-conscious about wearing visible metal brackets or wires. Making a decision in the debate between Invisalign vs. braces is best made in consultation with your orthodontist and by carefully evaluating your priorities and budget. Enjoying the convenience and appearance of Invisalign can be surprisingly affordable. The total Invisalign cost of treatment varies widely by patient depending upon the difficulty of the case and how long the treatment will last. To increase the affordability of Invisalign treatment, many patients are able to take advantage of orthodontic coverage in dental insurance plans, Flexible Spending Accounts, and convenient payment plans.